Tinytag data loggers monitor temperature to help assess planting and growing conditions in established vineyards and on land proposed for future planting. Temperature monitoring is important from a good practice point of view in regard to establishing a vineyard, but it also allows a better understanding of the sites as they mature, and how the sites may differ from one another. Gusbourne Estate is a producer of award-winning English wines, focused on the production of both high quality sparkling and still wines. The company's winery and the majority of their vineyards are in Kent, with vineyards also located in West Sussex on the South Downs. 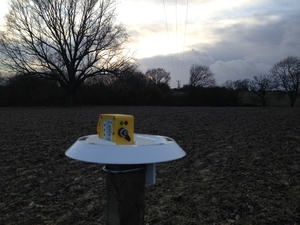 Gusbourne Estate has used Tinytag Plus 2 data loggers to monitor planting and growing conditions in its existing vineyards and on land proposed for future planting, in order to establish the temperature of the sites, and how these sites relate to each other. For example, monitoring can establish if there are any patterns relating to frost risk, or whether some sites are inherently warmer than others, which will affect management practices and harvest dates. A total of twelve Plus 2 temperature loggers record at 30 minute intervals across the Estate. Recorded data is downloaded annually and used to either calculate a mean annual temperature, or overlaid on a graph showing results from all twelve units to highlight any anomalies or points of interest. Jon Pollard, Vineyard Manager at Gusbourne Estate comments, "Gemini has a great reputation and a great product. We have found the Tinytags to be easy to use, robust and durable. We are delighted to be working with a local firm which has been very helpful and responsive with our requirements."